In recent articles we have looked at the typical architecture of the Early Neolithic in Northern Europe. This was clearly domestic and agricultural in nature. However, by the Early Bronze Age in Southern Britain, we see the development of much larger and more elaborate buildings. These structures are marked by concentric rings of posts and have been referred to as type Ei buildings. Woodhenge, overlooking the River Avon, two km from Stonehenge, is one of the best fully excavated examples. I chose Woodhenge because it goes straight to the heart of the matter: We have a complete plan, so there will be no ambiguity. If you are new to Theoretical Structural Archaeology, you are in for a bit of a shock. You may have to forget a lot of what you learned about Bronze Age ‘ritual’ monuments in the last 30 years. It has all been a bad dream, and I think some of the scarier bits are going to go away now. Twenty years ago, some people still regarded these structures as buildings, but how they worked was always rather hazy. However, it has become fashionable to think of these structures as ‘timber circles’, associated with ‘ritual’, a concept traditionally used by archaeologists to give meaning to things they can’t understand. Type Ei structures do not represent some ritual phase of cultural development, where posts were freestanding, before the advent of roofing, but a technological approach for creating wide roofed spaces using curving roofs. This why they persist into the Iron Age, although, not being roundhouses, they are not always recognised. In this, the first of two articles, we shall look briefly at the archaeological background to this architecture, the archaeology of Woodhenge, and other matters arising. How to model this type of structure in detail will be considered in the next article. Buildings of this scale are inherently difficult and complex to build, which, in a sense, is why they existed at all, and why we need to take a run at it. In previous articles we have looked at the basic constraints in creating roofed space in terms of both timber and form. Roundhouses don’t work over a certain diameter, and longhouses just get longer. Type Ei buildings created larger spaces by taking a long structure and turning it in a circle on itself, creating an annular roof, like a donut with a pitched roof. This is not the end of the story, as there are some interesting ways of treating the centre of the structure. Woodhenge [left, on Google Earth] has a ground floor area of about 1600m², whereas most roundhouses were less than 180m². What this represents in terms of accommodation depends on the arrangement of floors. So who would commission such a structure? While most of us know bronze is an alloy of about 90% copper and 10% tin, very few would know how to make it starting from its raw materials, even if they knew where to find them. Making metals raises the technological bar beyond the reach of all but the specialist. Unlike iron, which is relatively common, copper, and in particular tin, are rare. To say everybody wanted, or perhaps even needed, metal, not least for tools and weapons, is to overlook the fact that people had got along perfectly well with stone and other tools, and would continue to do so for some time. However, bronze, and even hardened copper, can be used to make new and better types of tools and weapons, as well as a whole range of other items. Hitting each other with rocks and sticks is a game we can all join in, but once you raise the stakes with specialist weapons based on a new, and frankly mysterious, technology ordinary folk can only join in when invited. Let's be very brutal and base: weapons allow you to kill someone and take their stuff; although a more subtle approach is to threaten to kill them, or protect them from being killed, and get them to give you stuff on a regular basis. In most societies where we have a view, by the Bronze Age we have clear evidence of elites, a process evident well before this in most cultures regarded as civilisations. Although it is no longer fashionable to use the term aristocracy, or royalty, once these people turn up, you usually need a revolution to get rid of them. The principal issue in understanding these societies, both ancient and historical, is power, and how it was distributed; who had it, and how was it exercised. In an age of slavery, where someone could own and have exclusive use of another human being, blood, status, and patronage were vitally important. While prosperity is dependent on the agricultural and industrial productivity of the local population, elites tend not to be overly involved in these activities in a hands-on kind of way. They preferred more recreational lifestyles, and historically, more Mesolithic activities, like hunting. They consorted, cavorted, schemed, and fought with their own kind. They lived more mobile lives, and often had a different and distinct material culture. The position of elites can be so hardwired into a culture that they have exclusive use of certain materials, styles of dress, foods, animals, areas, and architecture. From pyramids to palaces, castles to cathedrals, elites used architecture in the exercise of their power. 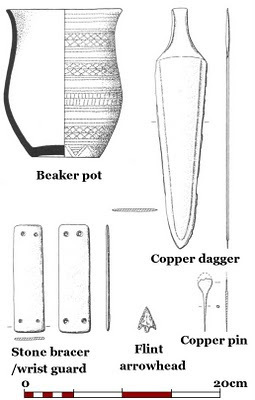 In Western Europe, the arrival of metalworking is associated with the Beaker culture. Beakers are distinctive drinking cups, and importantly, they are found in the graves of individuals, accompanied by a range of other grave goods such as flint knives and arrowheads and stone bracers/ wrist guards, as well as metal objects like daggers, clothing pins, and gold jewellery. Beaker graves, predominantly of men, laid on their side with legs pulled up, as if sleeping, are very different from the earlier Neolithic burial practices. These graves, often under barrows or cairns, subsequently become the focus of secondary graves, frequently of women and children. 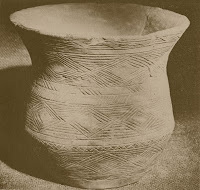 These burials appear in most areas during the Third Millennium BC, and there is complex sequence of international and regional types of beaker. Many types of artefacts and material have a European distribution, and this may be seen as simply indicative of trade, but I prefer to see it as also indicative of a more mobile, and perhaps international, elite. Britain is an island, which means you have to have a boat to get here; this is not insignificant. In addition to certain natural advantages of soil and climate over some other areas, Southern England was ideally placed to exploit the trade in copper, gold and tin from the Irish Sea and southwest peninsula. One of the finest excavated examples is the Bush Barrow, excavated in 1808, one of a group on the Normanton Down Ridge, near Wilsford, not far from Stonehenge. It contained an adult male, whose copious grave goods included daggers, an axe, and sheet gold items. 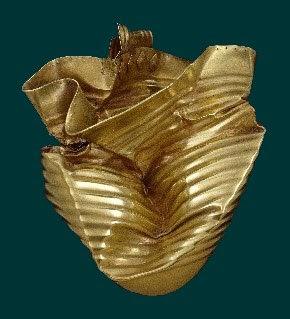 One of the most interesting aspects of the sheet gold work is that it forms a group with other similar pieces, mostly from Brittany, probably made by the same individual. Many material aspects of these Early Bronze Age graves are paralleled elsewhere in Europe. As with ‘beaker’ burials, cups still occur made from pottery, shale, amber, and notably gold; these have strap handles attached by lozenge shaped rivets, and are found as far afield as Mycenae in Greece. The Mycenaeans were one of the rising powers of the Mediterranean, thought to be the one of the principal protagonists in the Trojan war, as well as the major benefactor, if not the cause, of the decline of Minoan influence in the region. Various instances of artefacts and ‘influence’ link Britain, Ireland, and other parts of Europe to the Eastern Mediterranean during the Second Millennium, and these associations are particularly strong in southern England. Rich burials with weapons and drinking cups, together with other luxurious and exotic items, are a feature of Aegean culture, and are consistent with the aristocratic martial culture depicted in stories like Homer's Odyssey, recorded 1000 years later. However, while many of the same features occur in our burial record, unlike the Mediterranean, with the possible exception of Stonehenge, the architectural component of this culture has not really been recognised. Which is why Woodhenge and similar buildings are so important in providing the architectural backdrop for this early Bronze Age material culture. Woodhenge was discovered by aerial photography in 1925, was excavated by Maud Cunnington between 1926 and 1928  and was re-examined in 1970 and 2006. It is part of the Stonehenge World Heritage site created by Unesco in 1986. 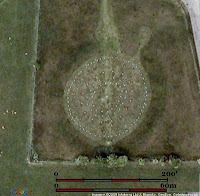 The original excavation revealed six slightly oval rings of postholes set within a ditched enclosure, with an external bank about 85m in diameter, known as a henge. It has a single entrance, making it a class I henge. 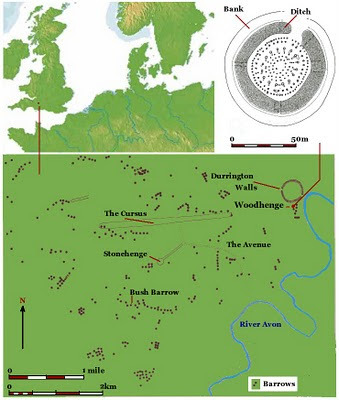 Class II henges, like Durrington Walls 500m to the north, have two or more entrances. The northeast-facing entrance of the henge, and the concentric nature of the features, suggested a similarity to Stonehenge, and led to it being dubbed ‘Woodhenge’ by the excavator. The rings of postholes are labelled A to F. The outer ring A has 60, B 32, C 16, D 18, E 18, and the inner ring F has 12, making 156 postholes in total. The largest postholes were in ring C, and were up to 2m depth. Many of the larger postholes had inclined slots on one side, known as post ramps, cut to facilitate placing the larger posts into their holes. Among the other features found was a child's burial in the central area, and several large holes thought by the excavator to once have contained standing stones. The site has produced some Middle Neolithic grooved ware ceramics, but also bell beaker and other pottery that spans the transition into the Early Bronze Age. Two radiocarbon dates obtained from the primary ditch silts, 1867+/-74 and 1805+/-54bc, also indicate its use in the Early Bronze Age. When modelling complex structures from archaeological plans of posthole foundations, it is often simpler to represent each post by a uniform coloured dot. Joining the posts together on a 1:1 basis creates a simple model. This is normally how prehistoric building has been perceived, and reconstructed. In plan, Woodhenge has those structural elements we would expect of a Neolithic building. The largest, deepest posts mark the central ridge of the roof, flanked on either side by the arcade. The centre of gravity of a curving roof, especially one with tapering rafters, would be closer to the wall than the ridge, and this is where the arcade is positioned. On the inside of the ring we have an ‘additional plate’ running roughly half way between the ridge and the arcade. 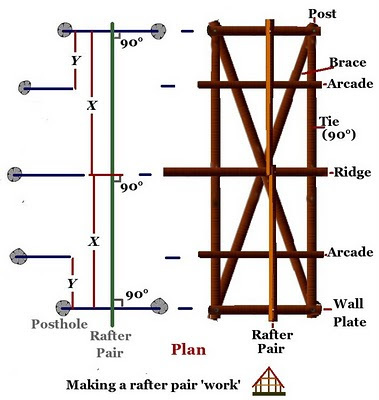 The all-important ties and bracing running across the building, between the wall plates, evident in longhouses, have been omitted from the simple model, and only some arcade ties are shown. The ridge is effectively 282’/ 86m long, the equivalent of about three longhouses joined together, but in places the roof is over 50’/16m wide, making it more than twice the width of most Neolithic buildings. While this is impressive, width being much harder to create than length, we should remember that Woodhenge was constructed 3000 years later than the longhouses we looked at in earlier articles, and the roundhouses of later prehistoric period were often just as wide. At certain points in the structure we can draw a reasonable working section, suggesting that, at least in terms of proportion, we are dealing with a roofed structure. However, while the model goes a long way toward establishing that the postholes at Woodhenge supported a roof, it falls well below the standards expected by a theoretical model of a building -- it does not ‘work’. The structural aspects of a building are like a machine supporting a roof and have to be constructed to exacting standards or it will not work properly. The rafter pairs should run at right angles to the wall plate, the arcade, and the ridge, and thus, the latter three structural elements should be parallel to each other. In addition, the distance between the ridge, the arcade, and the wall plate, should be consistent. When modelling a prehistoric building, I expect them to work to an accuracy of about 6”, or the thickness of a timber. On careful examination, our simplistic model does not meet these criteria. It is a very unbalanced form: the outer side roof is about 1500m², while the inner part is about 900m². Placing rafter pairs at right angles to the ridge cannot adequately account for roofing of those areas, or ‘corners’, adjacent to the ridge posts, which are not parallel to the centre line of the roof. It does not explain the additional plate. It does not really explain how the centre of the building worked. A simplistic section shows a very tall building [c. 50’/16m], open like a barn, which is of little practical use without floors. Floored buildings require stairs for access. To make such a building functional would require windows to light the interior. Overall, the whole scheme is flimsy and structurally naive for building of this scale, even given that ties and bracing have been omitted. None of this necessarily argues against Woodhenge's having been a building; rather, it tends to indicate that our method of modelling is inadequate. In the next article we will introduce a whole new theoretical basis for creating models, which utilises a different set of assumptions about the nature of building carpentry. I refer to this as Interlace Theory, one of the most important tools of Theoretical Structural Archaeology, and it solves the problems detailed above. 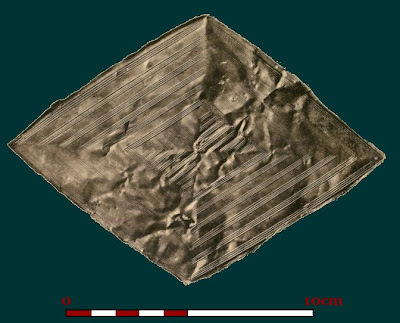 It is a methodology for understanding the archaeological footprint of large buildings with curving roofs like Woodhenge and other Type Ei structures. While this may seem a rather unsatisfactory conclusion to this current analysis of the plan, as I stated at the beginning, by any standards this is a very large and complex structure, and we cannot expect to understand it simplistically. However, I have another observation to make about the plan of Woodhenge, which may be of interest to the architecturally inclined reader. One of the most intriguing aspects of Woodhenge, from an architectural and design point of view, is why it is not circular like most Ei buildings. Egg-shaped or oval buildings are rare. The shape is probably best avoided, because it is a difficult shape to roof: rectangles, squares, and polygons based on circles are the normal basis for roofed structures. 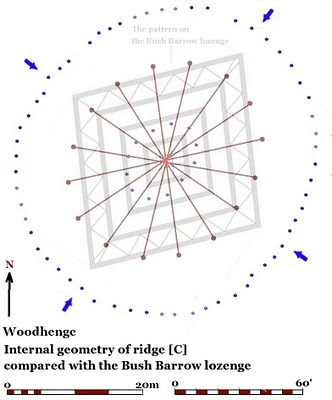 The most important aspect of the roof structure of Woodhenge was the 16 posts that comprised the ridge [Ring C], which were arranged radially in a symmetrical pattern. On this basis, the long axis of the plan runs about 35° east of north, with the short axis at 90° to it, which creates a rhombus. 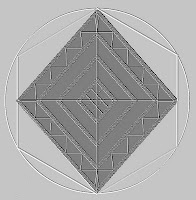 This is the same shape, and geometry as the Bush Barrow lozenge, which, as Tony Johnson established, has a layout based on a hexagon. This rhombus is quite a simple shape to create, starting from a hexagon drawn inside a circle by using its radius. Usually it’s one of the first things a student learns to do with a compass. 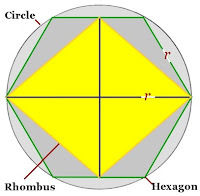 The corners of the rhombus are created from one axis running between two opposing corners of the hexagon, and another running at right angles through the centre of the figure to midway points on opposite sides. 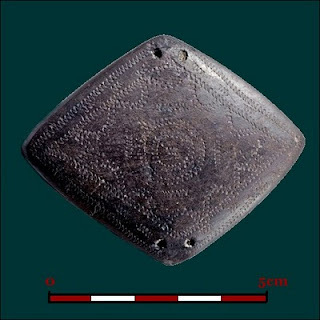 This type of lozenge motif, and variations of it, was common in the Late Neolithic and Early Bronze Age. It is found on all manner of artefacts, and was even carved into the stones of megalithic monuments, such as the passage graves in the Boyne Valley, Ireland. However, its occurrence in the laying out of a building raises the intriguing possibility that this shape was more than a simple decorative pattern, and held some deeper significance to the commissioner of this architecture. As we shall see, when we look at the structure in more detail, encoding this shape into the basic geometry allows the architect the opportunity to reproduce the pattern as a feature in the detail of the building. Another strand to this mystery are the perforated rectangular stone bracers, or ‘wrist guards’, found in Beaker period graves. Recent studies have suggested traditional interpretation of these artefacts as archers' wrist guards does not really fit the evidence, and that they may be better understood as something worn as markers of social status. It seems quite reasonable that these Early Bronze Age elites differentiated themselves using items of dress, a common practice in most societies. In non-literate societies, simple shapes and symbols are a good way of conveying who and what you are and how you fit into the greater scheme of things. In the medieval period it was known as heraldry, and it was very useful, not least when fighting in a battle. Extreme caution is required here, since these shapes are common in various forms in this period, and there is also a tendency for rare surviving objects, like the Bush Barrow Lozenge, to become overly pivotal in trying to join the scattered dots of prehistory. Given my view that Woodhenge is the architectural expression of the power of a local elite, I am inclined to see the use of this shape in the laying out of Woodhenge as part of broader pattern of use of this shape as symbol or emblem. 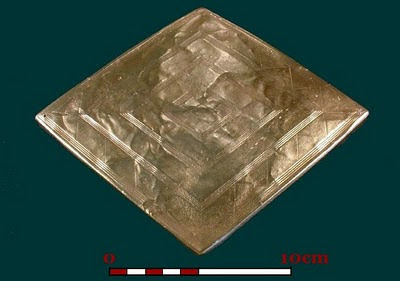 However, it is important to note that a similar gold lozenge was found found in the Clandon Barrow, near Matinstown, Dorset, which Tony Johnson has discovered is based on an octagon, not a hexagon. Incidentally, this barrow was excavated by Edward [Ben] Cunnington in 1882. 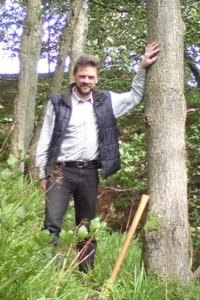 His grandfather William had dug the Bush Barrow with Sir Richard Colt Hoare in 1808, and his wife Maud was responsible for digging Woodhenge. 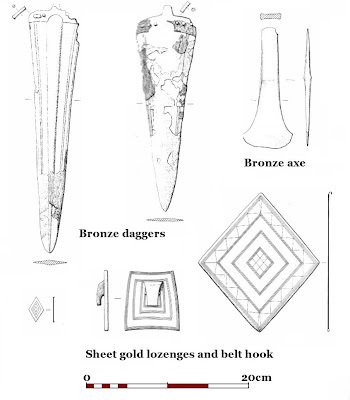 Piggott, S. (1938) "The Early Bronze Age in Wessex," Proc. Prehist. Soc. 4, 52-106. No particular comments so far as I look forward to seeing where you're going. However, I'm glad you commented on the importance of the area as some sort of link between Irish metal sources and Europe. PS thanks for the link. When I work out how to do that I shall undoubtedly return the favour. Thanks for the comment, and reading it before Martha had edited it! [I am having a nightmare with formatting in Google Blogger, which is being random about font type & sizes]. I will post part two when it's finished, but it is quite a complex issue, and will require some time to get the drawings right. I'd dearly love to be able to fund or employ you, Geoff! I know what it's like. I'm trying to get my brain 'round the cultural consequences of the Roman invasion of Britain at the moment. 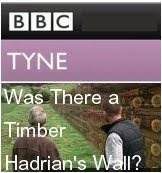 I'd understood that British shrines were made from timber until the arrival of the Romans, and became 'temples' when squared stone walls were built and the indigenous gods got new, Roman surnames. It's a fascinating idea that structural archeology can shed light on a symbolic culture that passed leaving so little. Thank you so much for your kind sentiment. I think it has some interesting implications for the arrival of classical religious architecture. With all respect the lozenge / rhombus was a solar symbol in the European late Neolithic & ealy Bronze Age. With regard to dwellings many of these people followed a pastoral existence so were likely to be semi-nomadic. Hi Anon, thanks for the comment. Lozenges are a common motif, and I am not sure that there is any evidence that they were used exclusively as a sun symbol. The idea that nomadic pastoralism is a practical way of life in Southern England is also unproven, due to the problem of over-wintering stock in our climate. There is abundant evidence for buildings, even if the architectural and structural principles are not well understood. My structural analysis of the evidence indicates that Woodhenge was a roofed structure; whether people in this period are perceived to have wanted or needed a building, is not a real issue. I would appreciate it if your sources included reference to my work. 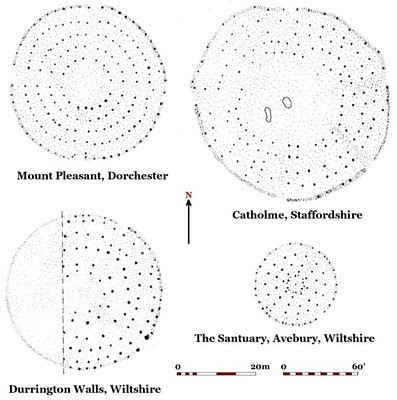 The Wiki page for Bush Barrows has reference to ‘Solving Stonehenge’ where it states ‘The design of the artifact known as the Bush Barrow Lozenge has been shown to be based on a hexagon construction’ This research, the Wiki drawings, and the fact that the Clandon Barrow Lozenge was ‘based on an octagon, not a hexagon’ is also a fact established by my original work (and also published in ‘Solving Stonehenge’ in 2008). You may be interested to know that the smaller Bush barrow Lozenge is also a hexagon based design (Solving Stonehenge p.269). Please accept my apologies if I overlooked your important contribution and failed to reference your work. Thank you for taking the time to draw my attention to this, I am always more than happy to have my all to frequent mistakes and omissions pointed out, enabling me to rectify them. One of the disadvantages of being outside the university system is it makes thorough research very difficult, and in my current circumstances, I cannot afford to buy access to academic or any other literature that I would be required to reference if this was proper ‘academic’ work. I have to try and make the best of what this new type of publication has to offer, unlimited colour pictures, multilingual support, free 24 hour a day, and I can correct my mistakes. I had always assumed the small lozenge was a miniature version of the big one; it is such a shame we have so little of this material, although I think the jet lozenge adds something to our understanding of this form. Most appreciated Geoff. Regarding the smaller of the two lozenges from Bush Barrow, and with reference to the forms having been based on a hexagon here’s how the smaller one was achieved (you already have the master shape of the larger). Construct the hexagon – usual method – draw horizontal line (this will be the longer axis of the lozenge), set the compass so as to scribe a circle of slightly less diameter than the line’s width. Following the usual convention use the compass to strike the vertices of the hexagon starting on one of the intersects with the horizontal line. Now take a line from each the top two vertices of the hexagon to meet the vertices which intersect the horizontal (joining i.e. top left to horizontal right, top right to horizontal left), repeat using the bottom two vertices. The Lozenge shape contained within the four lines is the exact form of the smaller Lozenge. So although both the large ands small lozenge uses a hexagon in their construction the hexagon is used in two quite different ways. From memory the smaller of the lozenges is almost exactly 1/50th the area of the larger, though I have no idea if there is any significance in that fact. Thanks for that, I had to draw it out to be sure I got it! I see it is a perfect little Rhombus with 120 ° /60 ° angles. Strangely, it looks like an off cut from the bands on the ‘mace’ shaft. It rather weakens my case that the Rhombus was a heraldic device; 3 lozenges with 3 different geometries. It seems likely that in this period, insignia would be most often be reproduced in fabric, and perhaps wood and pottery, and would not often be defined in metal, so its precise its form may not have been strictly defined. Alternately, each different geometry was symbolically significant, as in heraldry when small changes of detail are indicative, or the forms are entirely decorative. I am a former student of Stuart Piggot at Edinburgh in the 1960s I like your blog.Graduated 1965. I do not understand post processual archaeology I'm glad to say and though female I'm not a feminist. I cannot imagine how you can find out from postholes and pottery fragments what was the position of women in the structure of a tribe so I find I cannot understand modern books on archaeology and history. I hope i'll be able to keep up with your blog. 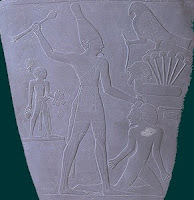 Thank you for your comment; - 'New' archaeology is made up / fabricated - it is an intelectual conciet. You will remember that so much of what we found we did not understand, so universities payed people to be expert on what we don't find; if there is no evidence, then you can't be wrong! New archaeology / postprocessualism is simply 'projcetion' - puting the thoughts in your own head into the minds of the long dead. As such, it is a second rate cult, a fraud - paid for by the tax payer. If you pay people public money to make up things- they gladly do it, and, as I know to my cost, fight tooth and nail to preserve their right to do so. So, it's not you, you were taught to think, moidern students are taught to believe.